I was cooking with an aubergine last night...and it suddenly hit me! Why on earth are aubergines also called eggplants? They don’t look anything like eggs! Even the world's dimmest chicken couldn't mistake an eggplant for an egg. For a start, they are massively bigger than eggs. They are long and pear shaped, not oval. They don't taste anything like eggs. You can't crack them. And, as if all that wasn't enough to give the game away, they are bright shiny extra-terrestrial purple! So why are eggplants called eggplants? PS I may not know much about eggplants but I do know why aubergines are called aubergines. And that's only because a Spanish tapas chef I know told me. It's because the French couldn’t pronounce ‘alberchigo’ properly. And 'alberchigo' is what the Spanish used to call aubergines (or eggplants). Re: I was cooking with an aubergine last night...and it suddenly hit me! Now those are what I'd really call eggplants. Aren't they beautiful! I'm absolutely amazed, Heels, because I have never ever seen your dainty white eggplants before. As luck would have it, today we had our double-bass-playing botanist friend round for a slap-up Sunday lunch. And over the cheeseboard I tried him out on why eggplants were called eggplants when they look nothing like eggs. He said exactly the same as you, Heels! And then he added some extra botanical insider info...he said that your small, egg-shaped, white aubergines were in fact exactly the way eggplants/aubergines used to grow and were always meant to be originally. He said that the sudden change to the glossy and garish zeppelins that grace our supermarkets today was all down to the efforts of armies of food technicians avidly competing with one another and successively breeding cultivars to change your lovely looking white eggplants into monsters. Motive? Greed disguised as science. Apparently, bigger and brighter means better business in the supermarket veggie world. He said it's just like the old 'Orange Carrot Trick' all over again...Dutchmen breeding carrots from being naturally manky-looking (ie a bruised purpley, yellowy or blackish colour) and turning them into the bright orange carrots that are universal today. I really don't like knowing that people have been mucking about with my food! So next summer I'll strike back and there might well be a healthy crop of proper white eggplants up at P-Kasso Allotments if I can find the seeds or plantlets to your Rotunda Bianca Sfumata di Rosa. I'm very particular as to whom I show my eggplants. Oh what a marplot you are! But the good news is you can relax. I would never ever even dream of asking such a well brought up lady such as yourself to flash her veggies. 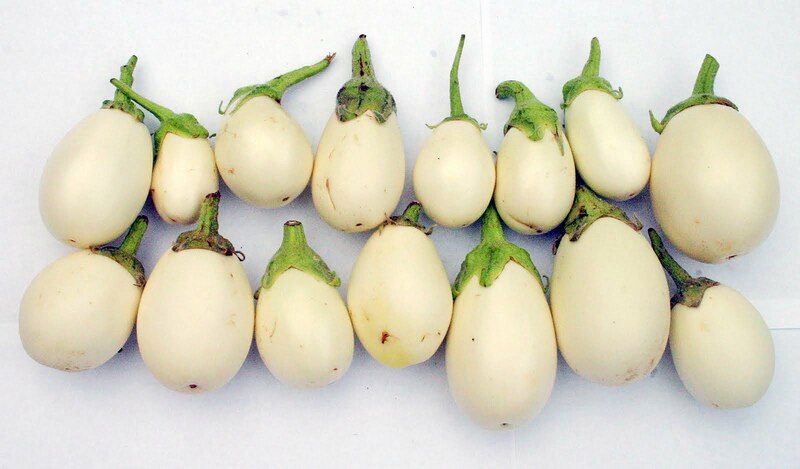 To change the subject slightly, you remember how I said that I was going to stage a fight back against the demon geneticists by growing my own snowy white eggplants? Well, I ditched that idea. Pronto. I did a bit of light digging on the RHS website and soon realised that woe, grief and disaster is all I can expect if I try to grow eggplants outdoors in Britain. I am not moving to South East Asia to get the right eggplant conditions so I am forever doomed to eating my mousakas stuffed full of the purple mutants. Nah, don't blame you - moussaka! Officially delish, even with the mutant purple ones. The only thing to remember is that some people insist on calling courgettes 'zucchin'i even though they don't look anything like a zucch. ...and those people are Americans, or using an Americanism. If the latter they deserve scorn poured upon them, and perhaps to be exiled, damn their eyes.